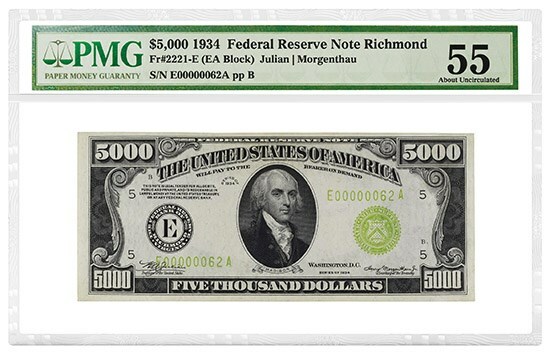 Six-figure results are likely for some of the PMG-graded notes in the sales. 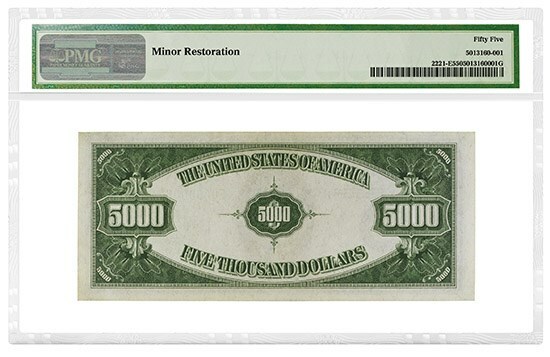 PMG-graded notes in high-dollar US denominations are expected to realize high-dollar amounts in a Heritage Auctions sale being held in late April. 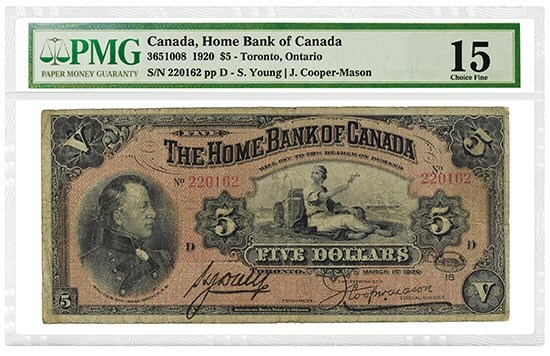 Meanwhile, PMG-certified rarities from Canada and India are among the highlights in a related world currency auction. Both sales are being held in the Chicago area amid the Central States Numismatic Society show. 1934 $5,000 Federal Reserve Note (Richmond), graded PMG 55 About Uncirculated. A scarce 1934 $5,000 Federal Reserve Note (Richmond), graded PMG 55 About Uncirculated, has an estimate from the auction house of $120,000 to $150,000. Meanwhile, a 1934 $10,000 Federal Reserve Note (Chicago), also graded PMG 55 About Uncirculated, has an estimate of $100,000 to $120,000. The $5,000 and $10,000 were the largest denominations of Federal Reserve Notes ever printed. They feature President James Madison and Civil War Treasury Secretary Salmon P. Chase, respectively. None were printed after 1945, and only a few hundred of each denomination survive today, making them highly coveted by collectors. 1920 Canada (Home Bank of Canada) $5, graded PMG 15 Choice Fine. To learn more about this note, click here. All estimates are provided by the auction house.